A private space station? This is the dream of Axiom Space, led by Mike Suffredini, who managed NASA's ISS program for 10 years, and Kam Ghaffarian, the CEO of SGT, a major NASA contractor responsible for ISS operations and astronaut training. Axiom plans to build the core of its space station at the ISS before the international laboratory retires, which is currently scheduled for 2024 but could be delayed until 2028. 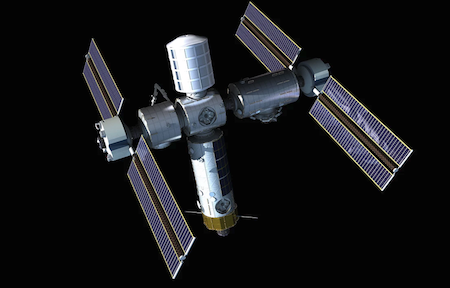 When the ISS finally calls it quits, Axiom's station will detach and become a fully independent commercial complex. Module 1 has its own propulsion system, meaning it will fly to the ISS under its own power after being dropped off in orbit. Axiom is currently proposing NASA connect the module to the forward-most port of the ISS, where a new mating adapter was recently installed to accommodate commercial crew vehicles. That mating adapter could then be moved to Module 1 and still be used for U.S. crew vehicle access. So Webb Foster had built his space laboratory. It took five years and the unremitting labor of a thousand men. But when it was finished, the planets marveled, and his fellow scientists ached with possessive longing. Fans of the (then young) Robert Heinlein recall with relish the privately owned Wheelchair space station from his 1942 novella Waldo. Read much more at Planetary.